Fees associated with filing a patent application in Vietnam as well as other patent fees are available in the fee calculator. The 12-month deadline applicable for the patent applications filed under Paris Convention cannot be restored. 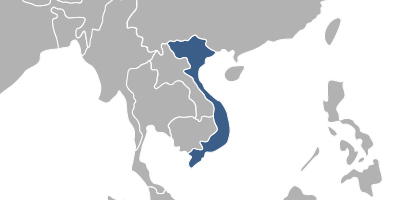 The filing language of patent registration in Vietnam is Vietnamese. The application materials in Vietnamese must be provided at the time of filing. The priority document must be submitted within one month from filing a patent application in Vietnam. Translation into national language is not usually required. A simply signed original POA must be submitted within one month from filing the patent application in Vietnam. Notarization or legalisation is not required. The substantive examination should be requested along with filing an application or within 42 months from the earliest priority date. The accelerated examination program is available. The application is published within two months from the date a Notice of Allowance is issued. The period for filing an opposition against a Vietnamese patent application by a third party commences on the publication date and ends before the granting date. It means that the period for the opposition is not fixed. The grant fee must be paid within three months from the date a decision to grant a patent is issued. Payment of the first annuity is usually settled together with the official fees for the grant. The following annuities should be paid within six months before the due date and may be restored for six additional months with payment of an additional charge. If the disclosure of the information on the invention has been made by the applicant, inventor or assignee at the officially recognised exhibition within six months before the date of filing, such disclosure does not disprove the novelty of an invention. It is required for the foreigners to perform the patent prosecution in Vietnam through an agent, a registered Vietnamese patent attorney. Please contact us if the above information contains any discrepancies with Vietnamese IP Laws.